Trump Was a Spark, Not the Fire The establishments, both media and conservative, failed to anticipate how they’d be consumed. God bless our beloved country as it again undergoes one of its quiet upheavals. Donald Trump will receive the Republican nomination for the presidency and nothing will be the same. How we do politics in America is changed and will not be going back. The usual standards and expectations have been turned on their head, and more than one establishment has been routed. A decent interval should be set aside for sheer astonishment. We face six months of what will be a historically hellacious campaign. Yes, we picked the wrong time to stop taking opioids. Before I go to larger issues I mention how everyone, especially the media, is blaming the media for Donald Trump’s rise. I hate to get in the way of their self-flagellation but that’s not how I see it. From the time he announced, they gave Mr. Trump unprecedented free media in long, live interviews, many by phone, some possibly from his bathtub. We’ll never know. It was a great boon to him and amounted, by one estimate, to nearly $2 billion worth of airtime. 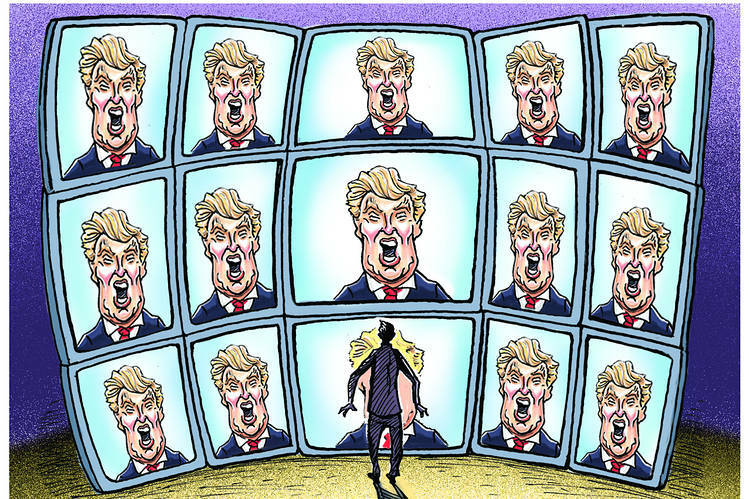 But the media did not make Donald Trump’s allure, his allure made for big ratings. Mr. Trump was a draw from the beginning. If anyone had wanted to listen to Jeb Bush, cable networks would have been happy to show his rallies, too. When Mr. Trump was on, ratings jumped, but it wasn’t only ratings, it was something else. It was the freak show at its zenith, it was great TV—you didn’t know what he was going to say next! He didn’t know! It was better than everyone else’s boring, prefabricated, airless, weightless, relentless word-saying—better than Ted Cruz, who seemed like someone who practiced sincere hand gestures in the mirror at night, better than Marco the moist robot, better than Hillary’s grim and horrifying attempts to chuckle like a person who chuckles. And it was something else. TV producers were all sure he’d die on their show. They weren’t for Mr. Trump. By showing him they were revealing him: Look at this fatuous dope, see through him! They knew he’d quickly enough say something unforgivable, and if he said it on their air he died on their show! They took him down with the question! It was only after a solid six months of his not dying that they came to have qualms. They now understood they were helping him. Nothing he says is unforgivable to his supporters! Or, another way to put it, his fans would forgive anything so long as he promised to be what they want him to be, a human bomb that will explode by timer under a bench in Lafayette Park and take out all the people but leave the monuments standing. In this regard today’s television producers remind me of the producers of 1969 who heard one day that Spiro Agnew, the idiotic new Republican vice president, was going to make a big speech lambasting the media for its liberal bias. They knew Agnew was about to make a fool of himself. Who would believe him? So they covered that speech all over the place, hyped it like you wouldn’t believe—no one in America didn’t hear about it. It made Agnew a sensation. The American people—“the silent majority”—saw it as Agnew did. “Nattering nabobs of negativism,” from the witty, alliterative pen of William Safire, entered the language. The producers had projected their own loathing. They found out they and America loathed different things. That’s a little like what happened this year with TV and Mr. Trump. My, that wasn’t much of a defense, was it? For this reason among others, I do not understand the impulse of the NeverTrump people to anathametize and shun those Republicans who will not vow to oppose Mr. Trump and commit to defeating him. They have been warned that if they don’t do these things they will not be allowed to help rebuild the party after Mr. Trump destroys it. Conservatives love to throw conservatives out of conservatism; it’s like an ancestral tic. But great political movements should not be run like private clubs. And have the anathemitizers noticed they aren’t in charge anymore? That in the great antiestablishment disruption of 2016 they have been upended, too? We don’t know what’s coming in 2016, or what happens to the GOP if Mr. Trump wins or loses. If there is a rebuilding of the party, as opposed to an ongoing reinvention, we don’t know when that will commence. If it is a rebuilding, on what grounds do the NeverTrump forces think it will be rebuilt? As a neoconservative, functionally open-borders, slash-the-entitlements party? Centers of gravity are shifting. The new Republican Party will not be rebuilt and re-formed in McLean, it will be rebuilt or re-formed in Massapequa.